On Tuesday evening at 7:00 PM, 461 Penn Manor High School seniors will graduate at the Alumni Sports and Fitness Center at Franklin & Marshall College. Tickets are required for the event. The ceremony will be streamed live on the Penn Manor website for anyone interested in watching the graduation beginning at 6:30 PM. Additionally, DVDs of the graduation ceremony may be purchased from Penguin Productions. Download an order form here. Student speakers for the evening (pictured from left) will be Megan Schlegelmilch (class officer), Mikayla Herbert (valedictorian), Ellen Blazer (salutatorian, class president), and Kayla Bixler. Megan will be attending the University of Pittsburgh majoring in pre-med, Mikayla will be attending Brigham Young University majoring in chemical engineering, Ellen will be attending the University of Pennsylvania majoring in mathematics, and Kayla will be attending Bryn Mawr College majoring in pre-med. On Monday, May 14, the 13th annual senior sports award social was held. Download a complete listing of all recipients. The Big 3.8 scholar athletes (student-athletes with a grade point average of 3.8 or above) were honored. These student-athletes include Landon Alecxih, Abigail Barley, Sara Bennis, Tyler Bitts, Kayla Bixler, Edward Bley, Alexander Cauler, Michelle Dempsey, Jared Emel, Megan Haines, Jennifer Hanner, Selena Hasircoglu, Mikayla Herbert, Andrew Herr, Joseph Jackson, Brendan Kincade, Alex Kirk, Harrison Manning, David Mohimani, Karen Myers, Karla Mylin, Brianna Rice, Jacob Schick, Megan Schlegelmilch, Jacob Shiner, Brian Sloss, Darren Spirk, Cody Straub, Robert Warfel and Dylan Weber. Thursday, May 24 was the senior awards ceremony. Over 160 awards and scholarships were presented to Penn Manor seniors. Download a complete listing of all award recipients. Top recipients were Ian Bricker (9 awards), Mikayla Herbert (9 awards), Kayla Bixler (7 awards), Chris Ressler (7 awards), Amy Feeser (6 awards), and Kelly Lenahan (6 awards). 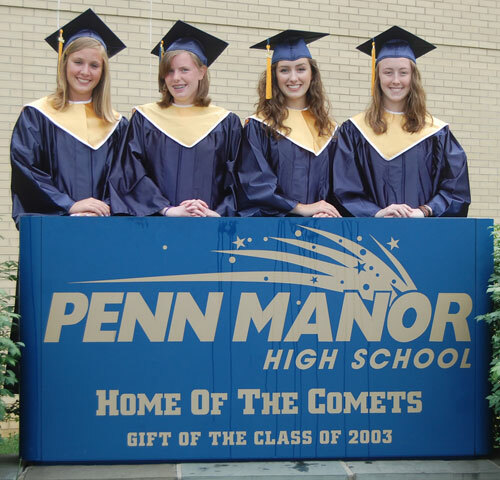 Congratulations to all the 2012 Penn Manor graduates.